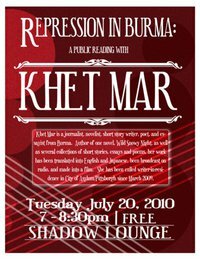 City of Asylum/Pittsburgh writer-in-residence Khet Mar will be reading on Tuesday at the Shadow Lounge at an event sponsored by COA/P, Pittsburgh Human Rights Network, and Amnesty International. She will speak on the deplorable state of human rights in Burma and the repression of journalists. After the reading Khet Mar will take questions from the audience and there will be a film screening and an opportunity to participate in an Amnesty International letter writing campaign. The reading is free and will take place on Tuesday, July 20 at 7pm at the Shadow Lounge. Click here for more information. Read more about Burma in Sampsonia Way. Khet Mar will be reading again on Thursday as part of American Shorts, a program that bills itself as “perfect for short summer attention spans.” It features readings, music, and film—all in small, digestible bites. They partner with local organizations to present entertaining and timely events. The theme of the evening is immigration to Pittsburgh and was organized in partnership with COA/P. Sampsonia Way managing editor Silvia Duarte will talk about navigating between the Spanish and English languages and Khet Mar will reflect on her journey from Burma to Pittsburgh. They will be joined by historian and journalist David Laskin. The reading will be followed by a screening of Richard Levien’s Immersion, a documentary that tells the story of ten-year-old Moises, a bright young immigrant from Mexico who faces obstacles at his new school. The reading will take place on Tuesday, July 22 at 7pm at the WYEP Broadcast Center. Click here for tickets and directions.